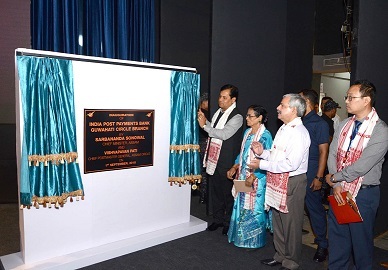 Assam Chief Minister Sarbananda Sonowal on Saturday formally inaugurated the India Post Payments Bank’s (IPPB) Guwahati Circle Branch at a programme held at Srimanta Sankardev Kalakshetra. Synchronising with the central launch of India Post Payments Bank at New Delhi by Prime Minister Narendra Modi today, the Guwahti Circle Branch of IPPB was also inaugurated by Chief Minister Sonowal here. Speaking on the occasion, Sonowal said that India Post has started a new era by opening IPPB which would enable the people in urban and rural hard-to-reach areas to avail banking services at their doorsteps. Stating that India Post has successfully overcome the challenge posed by science and technology towards its existence, the chief minister said that the department has now metamorphosed into a leading institution for providing cutting edge public service through latest technologies. He also extolled Prime Minister Modi’s push for adopting science and innovations which has made launch of IPPB possible. “There are 1.55 lakh post offices in the country out of which approximately 1.30 lakh are situated in rural areas. That is why, the farmers, labourers, artisans and craftsmen living in rural, inaccessible and tea garden areas would be able to connect themselves with the formal banking system of the country through IPPB,” the Chief Minister said. Stating that this banking system would help in eliminating middlemen from the system by directly transferring benefits of the government schemes to beneficiaries while facilitating cashless transactions; the chief minister said Prime Minister Modi has already implemented ‘Jan Dhan Yojna’ scheme making banking accessible for even the poorest of poor of the society. 21 crore people have opened bank accounts under Jan Dhan Yojna transacting 68 thousand crore rupees which is a remarkable feat in itself which has resulted in good governance at all levels, he asserted. The Chief Minister also urged the Postal Department to cater to the people living in 26 thousand villages, 800 tea gardens and 2400 char areas scattered across Brahmaputra and Barak valleys. He also called on the people of the state and particularly those in rural areas to take advantage of bank services of India Post. Speaking in the programme, Assam Education Minister Siddhartha Bhattacharya termed the occasion as momentous which would transform the old postal department to a new-age technologically backed service provider. India Post would henceforth be able to cater to the needs of the people adapting to changing times, he said. Chief Post Master General for Assam Postal Circle Biswapawan Padhi said that people would be able to avail services like opening of savings and current account, money transfer, direct benefit transfer, bill payment, merchant payment along with loans and such services through IPPB. Many top officials of Postal Department along with other dignitaries were also present on the occasion.